Across the Aisle has issued a press release announcing that Bishop Duncan has been formally deposed by the Presiding Bishop, Katharine Jefferts Schori. The AtA site also includes a personal letter to Bishop Duncan from the Presiding Bishop and the formal deposition. Mea culpa: My remark about spelling on my original post was the product of making a quick posting and misreading an address. Well, there are days like that. I was struck by two aspects of the Guyer piece. First, all the talk about how tragic was the September 18 vote to depose Robert Duncan, Bishop of Pittsburgh, was becoming tiresome. Yes, it was unfortunate that such an action was necessary, but removing this particular rogue bishop should have been done years ago, and the real tragedy is that it was not. Alas, even now, we cannot say, “My fellow Episcopalians, our long ecclesiastical nightmare is over.” Duncan has fled jurisdiction of The Episcopal Church for that of the Southern Cone, is still collecting a salary, is expecting to be returned as a bishop of Pittsburgh after the convention vote on “realignment,” and has even created a blog where angry Anglican leaders can express what a falsly maligned saint he is! Guyer, who clearly has a different view of Bob Duncan, has the courage and good sense to spare us the crocodile tears. Second, Guyer articulates the moral case against the Duncan program. Usually, it has been Duncan’s allies—the American Anglican Councils and the Global South Primates of the Anglican world—who have claimed the moral high ground, arguing that their agenda is God’s agenda, and therefore not subject to the usual restraints on ethical behavior. Guyer suggests that the “realignment” movement is a product of spiritual pride and a quest for power and money. Guyer calls on the upcoming convention to reject such a program. I do not expect “On pride and priests” to stop the “realignment” juggernaut, but it is high time that someone attacked “realignment” on its home turf. Read the essay. You likely will not agree with everything Guyer says, but he surely offers substantial food for thought. The Episcopal Diocese of Pittsburgh will vote Oct. 4 on whether to secede from the Episcopal Church—the U.S. branch of the Anglican Communion—and realign with a more theologically conservative Anglican province in South America. Robert Duncan, the bishop of the Pittsburgh diocese until he was removed Thursday by the Episcopal House of Bishops, has led this movement, both in Pittsburgh and nationally. Sigmund Freud, the father of psychoanalysis, believed that the desire for power is the central motivation of the human personality. Later this month, the T.S. Eliot play, “Murder in the Cathedral,” will be performed at Trinity Episcopal Cathedral in Downtown Pittsburgh. It should be a cautionary tale for the laity and the clergy who will soon vote about whether the Episcopal Diocese of Pittsburgh should remain in the Episcopal Church. Power in the form of moral purity does not exist anywhere in this world. There are always the subtexts, the unarticulated desires, the tacit motivations. While the hidden agenda may remain unclear, one does have an understanding about how an administrator should exercise his power in office. Should an administrator exercise his power in the best interests of his institution, or undermine it? If an administrator feels that an institution no longer reflects his values, should he not resign from it? Does an administrator in the office of a bishop have the right to take a diocese out of its parent organization and give its assets of $43 million to another diocese—maybe one of his own devising or perhaps one on another continent? When power is misused, it taints the hopes of those who are no longer with us and who have given money so that the structures and the doctrines of the Episcopal church will be here for future generations. The purpose for which these people have given money is thwarted and their trust is broken. Is this not a genuine ethical problem? Furthermore, are not the higher ethical values of religion sadly compromised in schism? Who has ever read a book about a church schism and concluded that this was the shining hour of faith? Then too one does question bishops and priests who try to gain power among their flocks like demagogues by promulgating simple, single-issue concepts like their objection to the ordination of women or their disapproval of homosexual practices. What gender can give more compassion to ministry than womankind? Do homosexual desires disappear when they are confronted by the screeds of a preacher or a bishop in a medieval hat? Do these same clergy preach so ardently against the turpitudes of heterosexuals? An intelligent church needs clergy who display the same understanding of the human mind—its desires and its mechanisms—as a psychotherapist. Science has done more than religion to liberate moderns from the superstitions of the past. Science has given us understanding through description. Intelligent religion can give additional meaning to that description. Additionally, Jesus himself never spoke about the subject of homosexuality as far as we know. Many clergy have said more about homosexuality in Jesus’ name than Jesus himself ever did. Sadly, many lunatic acts have been committed by religious people in history—acts that many sincere people lived to regret. Do we learn from history? How quickly the reign of Oliver Cromwell in England lost its purity, and some in New England who supported the witch trials later came to regret their participation in them. The clergy and the laity of the Episcopal Diocese of Pittsburgh are going to make a momentous decision soon that will affect all of us in a good or a bad way for decades to come. Power will be exercised in the process, with its far-reaching effects. The desire for power for some is a subtext in this drama. Some players in this drama will be looking for rewards more palpable than spiritual. The body of Christ will be torn. The promise of purity will be corrupted by time, as it casts its shadows. Decisions made in the heat of emotions devoid of reason will lead to madness, and madness leads to regret. My hope is that the laity and the clergy of the Pittsburgh Diocese of the Episcopal Church will exercise their faculty of “reflection in tranquility” in the days to come. Conroy D. Guyer is retired from the English faculty at Fox Chapel Area High School and is a communicant of Calvary Episcopal Church in East Liberty. He lives in Greensburg. “A Hopeful Future for the Episcopal Diocese of Pittsburgh: An Alternate Solution” required that a few documents be posted on the Web, and the growing collection of pages was increasingly looking like a Web site, albeit a rudimentary one. Today, I decided to add a little navigation to tie everything together. Across the Aisle Web can now be found on the Web at http://ata.episcopalunity.org. Be sure to see the photos from last week. There really were more than 300 people in St. Paul’s undercroft! The site also includes links to news stories that mention Across the Aisle. Yesterday was a busy day. Progressive Episcopalians of Pittsburgh (PEP) issued two press releases, and I had a part both in writing and distributing them. In conjunction with that work, I was updating three Web sites, including this one. Of course, what made the day a particularly tense one was the wait for news from the House of Bishops, which was meeting in Salt Lake City. The bishops were to take up the question of whether they would consent to the deposition of my diocesan bishop, the Rt. Rev. Robert W. Duncan. The Title IV Review Committee had certified last December that Bishop Duncan had abandoned the communion of The Episcopal Church, and the Salt Lake City meeting was the first opportunity for the bishops to take up whether to authorize the Presiding Bishop to pronounce deposition. Conversations with people in the Presiding Bishop’s office and with certain bishops had led PEP to conclude that a vote to depose was not especially likely, although some bishops seemed to be working behind the scenes to bring about that result. PEP had prepared three press releases for each of the likely outcomes: deposition (a sad but necessary step), a “no” vote on deposition (a problem remains unsolved), and delay (the bishop gets one more final chance to step back from the brink). All three press releases had been uploaded to our Web site. When I got the news of what action the House of Bishops had taken—this assumes that it was not “none of the above”—all I needed to do was to rename one of the files, delete the other two, and send out the appropriate text to those on our e-mail distribution list. I had just returned from a dinner run to KFC when I got the news that the House of Bishops had voted to consent to Bishop Duncan’s deposition. I quickly did the required operations—the action of the House was straightforward—and began making some phone calls to discuss the unexpected outcome. Among others, I called a local radio station that had asked to be notified when I learned something. Within PEP, there was, I think, a good deal of relief and satisfaction. Some of us had signed the accusations against the bishop and most of us had long ago concluded that he needed to be removed from any position of responsibility within The Episcopal Church. Many of our conservative brothers and sisters in Pittsburgh who expect to remain Episcopalians would have preferred that deposition be postponed until after diocesan convention, however. I lost track of the number of telephone conversations I had last night, and I had the satisfaction of breaking the news about deposition to a few people. We all knew, however, that relief needed to be tempered by realism. A chapter in the history of the diocese was coming to a close, but an even more trying chapter was beginning. Reading the comments available on the Web today is an interesting exercise. Duncan’s opponents are saying what a sad occasion this is and that we should be praying for Duncan and his family. No one seems willing to say “good riddance,” partly out of good manners, partly out of a desire not to be seen as dancing on Duncan’s grave, and, perhaps, mostly, because even deposition will not achieve the much-desired riddance. We are told that, although the bishop will not contest his deposition, he has (1) been accepted as a bishop of the Southern Cone (no doubt about his abandonment now! ), (2) he is still collecting a salary from the diocese as a “consultant,” (3) he is fully expecting to be tapped as the bishop of the “realigned” diocese after October 4, and (4) the diocese has now set up a blog to collect tributes from around the world to the fallen, yet oddly resurrected, hero (see In Support of Bishop Duncan). One doubts that Duncan came into the office today to clean out his desk, which is what the church has a right to expect. The good news is that Duncan’s deposition is assured. Some of us feared that, had the bishops deferred a vote, they might have chosen not to approve deposition should the October 4 “realignment” vote fail. On the other hand, deposition now is likely to create enough sympathy for Duncan to sway the votes of some undecided lay deputies to his side. (A few may be swayed the other way by the clear action of the House of Bishops, but no one seems to think that this effect will be the dominate factor as far as convention goes.) “Realignment” is expected to pass easily among the clergy. There are, of course, two more weeks before diocesan convention. Apparently, Duncan’s employment by the Diocese of Pittsburgh will continue during that period. Why, one might ask, would an Episcopal diocese employ as a consultant a bishop who has been thrown out of The Episcopal Church? Duncan, of course, is an expert in subversion of the church, and it is clear that subverting the church is exactly the program of 7 of the 8 members of the Standing Committee. No person may serve as an Assistant Bishop beyond the termination of the jurisdiction of the appointing Bishop or after attaining the age of seventy-two years. Anyway, it appears that the Standing Committee will be responsible for running the upcoming convention. In all liklihood, the “realignment” votes will carry, and, sometime later, we will determine that all but one member of the Standing Committee will be claiming to be in the Southern Cone. This will mean that they are not in The Episcopal Church, and the ecclesiastical authority of the real Episcopal Diocese of Pittsburgh will be the lone non-realigned member of the Standing Committee, who, one would imagine, the Presiding Bishop would have to recognize as running the diocese. (There is no reason for the Presiding Bishop to make such a finding, in the abstract, but the church needs to figure out to whom it should send diocesan mail.) Meanwhile, the other members of the former Standing Committee will likely hire Duncan as some kind of bishop under somebody's rules. Calvary Church and, perhaps, The Episcopal Church, will go to court to straighten it all out. The real Episcopal Diocese of Pittsburgh in The Episcopal Church eventually will call a special convention to put its house in order, and plans for that will no doubt go forward in parallel with the legal battles. After a brief moment of unexpected euphoria yesterday, I don’t think I want to think about that today. What I lack in legal and historical qualifications is perhaps partly compensated for by my command of logic, and I have brought what expertise I do have to the analysis of Episcopal Church polity, arguing elsewhere that dioceses are inextricably bound to The Episcopal Church and subject to the General Convention. (See “Unqualified Accession.”) Certainly, this is what Progressive Episcopalians of Pittsburgh has long argued in the Diocese of Pittsburgh. Rereading Joan’s paper convinced me that I should write a post about the problems I found in McCall’s arguments. I intended to direct readers to “History Revisited” in my essay. Discussing the matter with Joan, however, I discovered that she was eager to write a direct rebuttal to McCall’s arguments herself, and I was quick to encourage the project. To begin with, anachronistic assumptions permeate McCall's essay. If we are to understand what the eighteenth-century organizers of The Episcopal Church had in mind, we must be sure we are not reading later understandings into their documents. For example, McCall uses a U.S. Court of Appeals decision to define “accession” as becoming party to a treaty and refers to it as an “unusual” term in the law of contracts. That may be, but a simple consultation of the Oxford English Dictionary reveals a number of eighteenth-century examples of the use of the word “accede” to mean agreeing to a plan or opinion. Current dictionaries often use “submit” as a synonym. 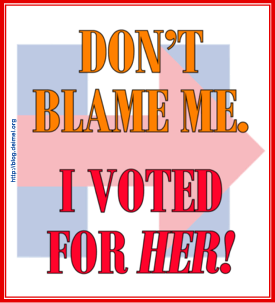 The founders thus used a word in a common context that people then would understand easily. On March 29, 1784, a small group of clergy and laity from three congregations met to discuss forming an organization in Pennsylvania. However, they “were of the opinion, that a subject of such importance ought to be taken up, if possible, with the general concurrence of the episcopalians in the United States.” Two days later, at another gathering of the group, they called a meeting for May 24 for clergy and lay representatives from every Pennsylvania parish. When that convention met, it appointed a standing committee to “confer with representatives from the episcopal church in other states, or any of them; and assist in framing an ecclesiastical government.” This convention then outlined a list of principles for forming such a government and called for a meeting of the larger church in New York in October 1784. One of the principles was “That no powers be delegated to a general ecclesiastical government, except such as cannot conveniently be exercised by the clergy and laity in their respective congregations.” McCall reads this as reserving power to the state conventions (dioceses). However, that is not what it says. State conventions are not even mentioned, since Episcopalians in many states, including Pennsylvania, had no such convention. Pennsylvania numbers its state conventions beginning with that of 1785, rather than with the 1784 meeting. It is hardly worthwhile for me to discuss “A Response to Mark McCall” in detail here. Instead, I invite you simply to read Joan’s essay and marvel at its effortless scholarship. You can find it here. Of course, my interest in Episcopal Church polity is intensified by the upcoming vote for “realignment” (i.e., removing the Diocese of Pittsburgh from The Episcopal Church and making it a part of the Anglican province of the Southern Cone). The McCall essay seems designed to offer a credible argument for the propriety of such a move. Because the Anglican Communion Institute has not encouraged schism in The Episcopal Church—senior fellow Ephraim Radner famously resigned from the Anglican Communion Network upon concluding that it was schismatic—I was surprised to find McCall’s essay offered under its sponsorship. McCall apparently offered the essay to the ACI unsolicited, and the ACI folks seem to have been taken in by McCall’s argument, even if they had qualms about its implications. I suspect that McCall is a proponent of “realignment,” but the ACI is not, though its principals seem willing to consider ecclesiastical arrangements within the Anglican Communion that I would consider destructive. I hope they will re-evaluate their embrace of Mark McCall’s arguments after they have read Joan Gundersen’s rebuttal. Although my usual bedtime ritual is to read before falling asleep, recently, I have been listening to old radio dramas on CDs or watching recorded TV programs. For making a smooth transition from wakefulness to sleep, there is much to be said for the CDs; one can lie down, turn off the light, fully absorb the program material, and, imperceptibly, fall asleep. Both reading and watching TV sometimes result in my waking up in the wee hours of the morning propped up uncomfortably in my bed with the lights on. Months ago, I decided to rewatch Babylon 5, the sci-fi series from J. Michael Straczynski, which I own recorded on videotape. Because the series has more than 100 hour-long episodes, I’ve had some opportunities to consider the transition to sleep when watching Babylon 5 at bedtime. I find that I can stay awake watching the television longer than I can reading a book. At some point, I need to acknowledge that it’s time to get to sleep, however, even if I can stay awake and watch more Babylon 5. I have taken to laying my pillows flat on the bed, turning out the light, hitting the Sleep button on the remote control, and lying down to drift off. If all goes well, I will be asleep before the television turns itself off, but, in any event, I reset the tape counter before lying down, so I can rewatch what I can’t see lying in bed with my eyes closed. The only thing wrong with my falling-asleep-to-the-TV routine is the brightness of the screen. Not only does it light up an otherwise dark room, but it often makes the room darker or lighter suddenly, a behavior not conducive to drifting gently off to sleep. Of course, I could adjust the brightness and contrast controls to minimize the light given off by the television, but this would mean readjusting them when I want to return to normal viewing—not an attractive option. There is a Mute button on the remote control that turns off the sound. Why isn’t there a corresponding button to turn off the screen? Why not indeed! Such a control would be useful when you want to fall asleep with the TV on, but it might also be useful on other occasinons: when something is being shown that you don’t want to see or don’t want your children to see, for example. Having thought up a new control for my remote, I began to consider what to call it. I immediately thought of labeling the button “Blind.” I realized, however, that this was not a good choice. “Mute,” which I take to be a verb, rather than an adjective, means to diminish (or extinguish) the sound from. “Blind,” as a verb, can have any of several meanings, but the one that comes to mind most readily is to make sightless. The television does not have sight, however; it emits light, rather than receives and interprets it. I began to consider other words meaning to prevent light from getting through: mask, veil, shroud, cloak, hide, shield, eclipse, obscure, conceal, or, ironically, screen. Other candidates include words that indicate reducing the light intensity: dim, bedim, darken, befog, or obfuscate. For labels on remote controls, short and obvious is always better than long and obscure. How about a Mask button or a Cloak button? Or, if the screen does not go completely to black, a Dim or Darken button? My personal favorite is the Mask button. This would make a fine addition to any TV remote. So, is anybody going to add this control to their televisions? For a time, AtA had every reason to want to fly below the radar, as moderates and liberals who had long fought against an increasingly intolerant diocese began tentative discussions with conservatives who had come late to the campaign. Moreover, it was clear that some players in AtA are deeply suspicious of the media. One cannot hold an event intended to attract people from multiple counties without telling them about it, however. Publicity was essential for the September 13 event. No one in AtA actually asked for a logo, and the group even seemed to get its name rather by default. Those in the predecessor group resolutely declined to take on an official name, much less a logo. This was rather an inconvenience when it decided to sponsor “A Pittsburgh Episcopal Voice” and tried to explain that it wasn’t really Progressive Episcopalians of Pittsburgh, even though few participants were not PEP members. 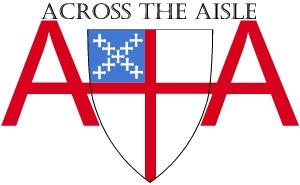 “Across the aisle” was first used as an informal designation for the initial contacts between the original group and the 12 mostly conservative priests who announced their intention to stay in The Episcopal Church in a letter last January. As discussion expanded, the larger group began to look more like an actual organization, and it came rather naturally to be called “Across the Aisle.” I don’t know that there was ever any explicit agreement to call it that, but no one seemed to want to negotiate a replacement name. I rather liked “United Episcopalians of Pittsburgh” as a name, but my proposal for a name change did not get any traction. That the eye tends to associate the large red A at the left with the A of “ACROSS” has the effect of making “CROSS” stand out as though it were a separate word. This emphasizes the fact that there actually is a cross in the Episcopal shield. Interestingly, when I first sent out the logo for comment, some people indicated that they liked it, even though I learned later that they did not recognize the cross as acting as the T in “AtA.” (The failure to see the T in this logo is even more remarkable than the failure, by most people, to see the arrow in the Federal Express logo. See “Deconstructing an Icon.”) Anyway, this logo is the one we used for most of the publicity for “A Hopeful Future,” but the original logo was used for posters, on which we paired “Across the Aisle” to the right of the logo with a tagline. The first design simply did not work at all unless the logo was big. The addition of “DIOCESE OF PITTSBURGH,” which I thought brought a certain balance to the design and provided more context for the group that it was to represent proved controversial. 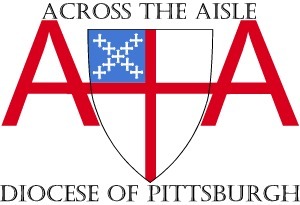 Some argued that the words suggested that AtA was an official initiative of the diocese or that they implied that we would soon be the Diocese of Pittsburgh. I argued that we were merely saying that AtA was within the diocese. A suggested solution was to delete “DIOCESE OF,” but I thought this was offensive to the many people of the Diocese of Pittsburgh who do not actually live in the city of Pittsburgh. In the end, we dropped the legend at the bottom completely, perhaps for the best. I am rather fond of the logo, but it may have a very short shelf life. If convention votes to “realign,” the people of AtA will be actively involved in reorganizing the diocese. That diocese should be one that includes all Episcopalians without prejudice, and there will be no need for AtA as an organization. What the future of AtA will be if the vote goes the other way, however, is unclear. Perhaps it will have an orgoing role. I described the origin of Across the Aisle in my post “Whither Pittsburgh?” The group has steadily gained participants since early this year and has been working on how the Episcopal Diocese of Pittsburgh (i.e., the real Episcopal Diocese of Pittsburgh that is part of The Episcopal Church) will respond to the vote to “realign.” The (improper) vote to leave The Episcopal Church and to attach the diocese to the Anglican province of the Southern Cone is expected to pass, although passage is by no means certain. Whereas the Pittsburgh clergy will surely vote in large numbers for the measure, the lay vote is harder to predict. The September 13 event has two main purposes: (1) to encourage deputies to vote against “realignment” and (2) to explain how the diocese will be reorganized if the vote succeeds. “A Hopeful Future for the Episcopal Diocese of Pittsburgh: An Alternative Solution” will be held at St. Paul’s Episcopal Church, 1066 Washington Road, in the Pittsburgh suburb of Mt. Lebanon. It is scheduled for 1 to 3 PM. Refreshments will be served. The press release about the event can be found here. A poster about the event is available here. In his second paragraph, Williams uses a phrase about which I constantly chide reporters, “Anglican Church.” What does the archbishop mean by this? Because he wants the Anglican Communion—a fellowship—to be a real, unified, worldwide church, he speaks as though it is. Well, it isn’t. Williams’ use of “Anglican Church” was dismaying, but not surprising, as the archbishop seems to have it in his head that greater centralization within Anglicanism is the key to moderating conflict. It is more distressing and damaging when “Anglican Church” appears in publications from The Episcopal Church, as it does in the essay by layperson Nelson Smith “Get off the sidelines: With teamwork if not affection, the Anglican Church can be a force for peace and justice” that recently appeared on Episcopal Life Online. In addition to its use in the subtitle, “Anglican Church” occurs three times in the body of the piece. This is, I think, a fine and timely message, except, of course, for the “Anglican Church” part. Clearly, Smith is referring to the churches—note the use of the plural here—of the Anglican Communion. He is neither asserting the existence nor advocating the establishment of a monolithic “Anglican Church,” and he is likely unaware that Episcopalians as passionate as himself might be anguished by his use of the term. The editors of Episcopal Life Online should have required Smith to drop “Anglican Church” in favor of “Anglican churches,” “churches of the Anglican Communion,” or something similar. I am not advocating censorship; “Anglican Church” is simply an erroneous designation that could mislead some, while giving aid and comfort to those insurgents in The Episcopal Church who, unable to get their way through the normal deliberative processes of the church, are conspiring to do so by converting the “Instruments of Communion” into instruments of coercion. In fact, I would not object to Episcopal Life Online carrying an essay advocating centralization of authority within the Communion. I do object, however, to the failure to edit material so as to avoid undermining the church gratuitously.